Gertrude Luce, the eldest daughter of a wealthy tea planter, and her three unmarried sisters dedicated their lives to public work. Soon after the formation of Voluntary Aid Detachments (VADs) in 1909 she raised the Malmesbury Women’s Detachment (Wilts 22) as its Commandant until the late 1920s. She then became its President for another 20 years. Miss Luce led her contingent to help in the Countess of Suffolk’s Auxiliary Hospital at Charlton Park from the start of the war until October 1915 when the Countess closed it to join her husband in India. 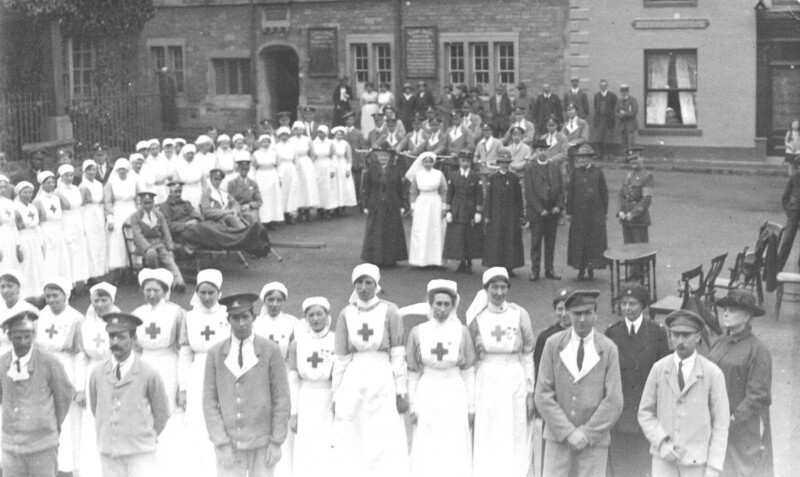 In response to the increasing casualties arriving from the Western Front, in July 1916 Miss Luce took command of Malmesbury’s Cottage Hospital for the Red Cross. She organised its expansion to premises throughout the town, taking over the YMCA in Cranmore House, the Wesleyan Chapel and the Burton Hill Manor House, enabling care for up to 110 soldiers in addition to the usual sick and injured civilians. A total of 778 soldiers were treated during the war. Harry Hinwood, a Malmesbury shopkeeper, was temporarily blinded by mustard gas. After evacuation to his home town, as his bandages were removed he exclaimed “Oh, Miss Luce, it’s you”. The swift reply was “Commandant Luce to you, Hinwood” – discipline had to be maintained! 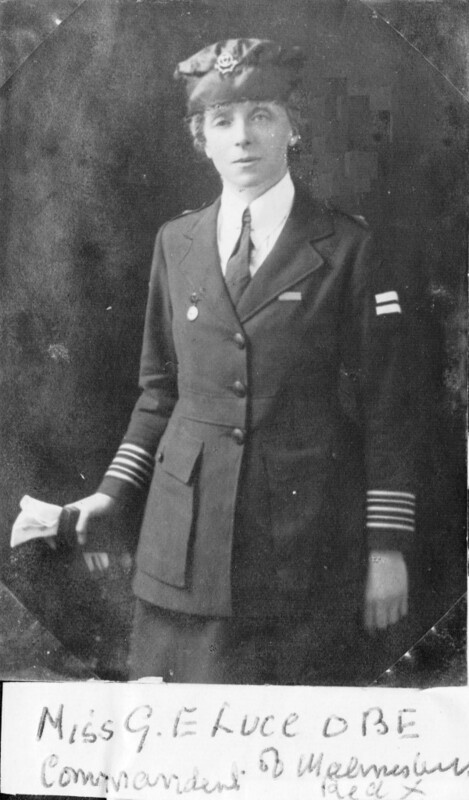 On 3 June 1918, Gertrude Luce was awarded the O.B.E. by the King for her work. She was unaware that her name had been put forward and was said to be overwhelmed by the “right royal” reception at a surprise parade in her honour. She remained active in the town and became a Justice of the Peace and a County and District Councillor, as well as being Chairman of the Malmesbury Grammar School Governors for 25 years. Miss Gertrude Luce wearing the Red Cross Commandant’s uniform. 3 June 1918. Miss Luce (centre) was collected in a horse drawn carriage by RSM Harwood, DCM & bar (centre right) and escorted by convalescent soldiers on bicycles (rear). The tall nurse in the centre of the front row is Elsie Cuss. This story was donated by Charles Vernon of Athelstan Museum, Malmesbury.